In this Photoshop Effects tutorial, we're going to learn how to use layers, layer blend modes, some noise, a little sharpening, and a simple adjustment layer to easily give a photo an "extreme contrast" effect. The Layers palette now shows the duplicate of the Background layer, named "Layer 1", above the original. After desaturating "Layer 1", the image appears black and white. We now have three layers in the Layers palette. Change the blend mode of the top layer from "Normal" to "Screen" to lighten it. Lower the opacity of the layer to 50% after changing its blend mode to reduce the brightness. The image after changing the blend mode and lowering the opacity. Click on the Background layer to select it, then press "Ctrl+J" (Win) / "Command+J" (Mac) to make another copy of it. With the "Background copy" layer selected, press "Shift+Ctrl+]" (Win) / "Shift+Command+]" (Mac) to jump the layer to the top of the Layers palette. Step 6: Change The Layer's Blend Mode To Either "Overlay" Or "Color Burn"
Change the blend mode of the 'Background copy' layer to either "Overlay" or "Color Burn" depending on your image. Again, it will depend on your image and what you think looks best. The image after changing the blend mode to "Overlay" and lowering the opacity to 75%. Merge all the layers onto a new layer at the top of the Layers palette. Go to Filter > Noise > Add Noise to bring up the "Add Noise" dialog box. When the dialog box appears, enter an Amount value of somewhere between 2-5% depending on the resolution of your image. I'm using a low resolution image for this tutorial, so I've set mine to 2%. If you're using a higher resolution image, which you probably are, set it closer to 5%. Set the Distribution option to Gaussian, and make sure the Monochromatic option at the bottom is checked so we don't end up with color noise. Click OK to apply the noise and exit out of the dialog box. The image after applying noise. Go to Filter > Sharpen > Smart Sharpen to sharpen the image and enhance the noise. 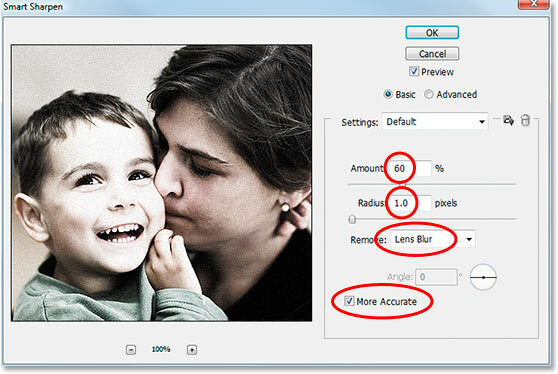 When the dialog box appears, enter an Amount value of somewhere around 55-60%, a Radius value of 1 pixel, set the Remove option to Lens Blur, and finally, make sure More Accurate is checked at the bottom. Then click OK to exit out of the dialog box and apply the sharpening. If you're using a version of Photoshop prior to CS2, you can use the "Unsharp Mask" filter instead by going up to the Filter menu, choosing Sharpen, and then choosing Unsharp Mask. 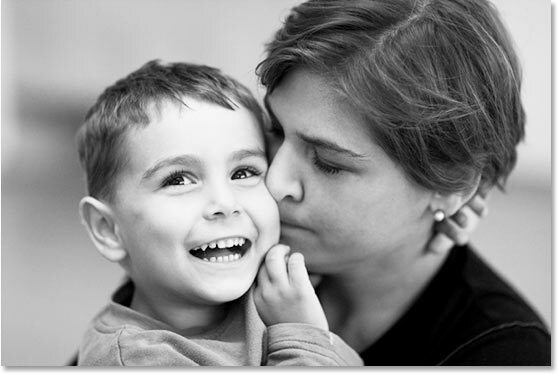 Enter an Amount value of around 150%, a Radius value of 1 pixel and a Threshold value of 0. The image after sharpening and enhancing the noise. Step 10: Add A "Curves" Adjustment Layer And Set Its Blend Mode To "Multiply"
With "Layer 2" selected at the top of the Layers palette, click the "New Adjustment Layer" icon at the bottom. Select "Curves" from the list of Photoshop's Adjustment Layers. Change the blend mode of the Curves adjustment layer to "Multiply". Changing the blend mode of the Curves layer to "Multiply" causes the image to darken. Use the Elliptical Marquee tool to drag out a large oval selection, extending it out beyond the left and right sides of the image. With the Curves adjustment layer still selected, press D on your keyboard to reset your Foreground and Background colors. Normally this would result in your Foreground color being black and your Background color being white, but because the layer mask on the Curves adjustment layer is currently selected (you can see that it has a highlight border around it to indicate that it's selected), we get the exact opposite. White becomes your Foreground color and black becomes your Background color whenever you reset your colors with a layer mask selected. After filling the selection with black on the Curve adjustment's layer mask, only the corner edges remain darker. 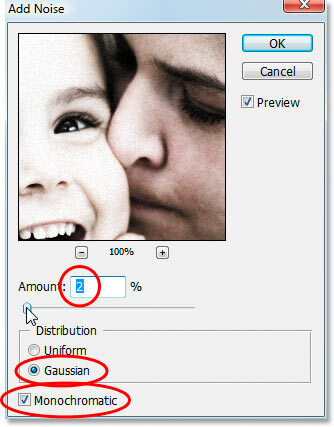 Go to Filter > Blur > Gaussian Blur to bring up Photoshop's "Gaussian Blur" filter. 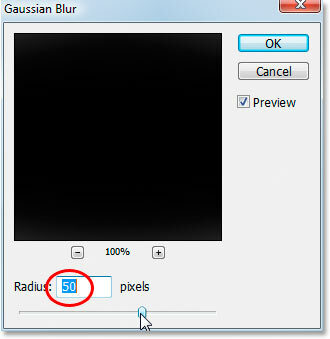 As I mentioned, I'm using a low resolution image for this tutorial, so for me, a Radius value of about 50 pixels blurs the edges out nicely. If you're using a high resolution image, you'll probably want to use a setting of 150 pixels or higher. The idea is simply to blur out the edges so they transition nicely from darker in the corners to lighter as you move towards the center of the image. Keep an eye on the image itself to see a preview of the blurring effect as you're dragging the slider bar at the bottom. And there we have it! That's how to create an extreme contrast photo effect with Photoshop! Visit our Photo Effects section for more Photoshop effects tutorials!